The sanctions imposed on Qatar by the UAE and several other Arab countries might result in an outflow of external funding for Qatari banks, which are already under mounting pressure amid worsening cash crunch, lower credit rating and hike in cost of funding, financial analysts said. Following the recent breakup of diplomatic, trade and transport links with Qatar by Saudi Arabia, the UAE, Bahrain, Egypt, Libya and Yemen, the creditworthiness of the Gulf state has became vulnerable to a potential risks. These include domestic political risks, a spike in government debt, significantly higher contingent liabilities, and scarce external funding sources, credit analysts said. S&P Global Rating, however, noted that Qatari banks' current liquidity profiles should help them absorb a moderate drop in external funding. Overall, Qatari banks' net external debt totalled about $50 billion at the end of April 2017. "We classify the authorities in Qatar as highly supportive toward the banking system and expect government support will be forthcoming in case of need. However, if the situation is not resolved relatively quickly, it might exert further pressure on banks' credit quality," the rating agency said. S&P has lowered long-term rating on Qatar National Bank to 'A' from 'A+' and put all ratings on QNB, The Commercial Bank, Doha Bank, and Qatar Islamic Bank on CreditWatch negative. "We regard the Qatari banking system's reliance on external debt as a source of tail event risks in Qatar," said S&P. External system-wide debt has risen sharply over the past few years, reaching $125 billion on April 30, 2017, with a significant portion coming from Europe and Asia. On the same date, banks had a net external debt position of $50 billion, representing 23.5 per cent of domestic loans compared with 13.2 per cent at year-end 2015. Qatari banks' external funding structure is dominated by bank liabilities and nonresident deposits, which comprised 89 per cent of the banking system's gross external debt on April 30, 2017. Since the geographic breakdown of liabilities of Qatari banks shows that the GCC represented only around eight per cent ($20.6 billion) of the total, they will be in a position, on a stand-alone basis, to face a significant reduction of external funding, the rating agency said. Shares in Qatari banks fell in early trade on Sunday after the Central Bank of the UAE ordered the nation's banks to be wary of any accounts they hold with six Doha-based banks. The central bank has also ordered local lenders to stop dealing with the 59 individuals and 12 entities with alleged links to Qatar and to freeze their assets. The central banks in Saudi Arabia and Bahrain had also asked lenders to provide details of their exposure to Qatari clients. Banks have also been requested to share information about exposure to Qatar through products including equities, bonds, and interbank funds. The move could squeeze liquidity at Qatari banks, which get a significant amount of their funding from the region. Qatari banks have $16 billion in funding in the form of customer and interbank deposits from other Gulf states, according to Chiradeep Ghosh, banking analyst at SICO Bahrain. Steffen Dyck, vice-president and senior credit officer at Moody's, said should the rift between the GCC countries persist, it would be credit negative for Qatari banks, owing to their reliance on confidence sensitive foreign funding, which currently accounts for 35 per cent of total liabilities. "We expect that Qatari banks' funding costs will likely rise for debt securities [11 per cent of foreign funding], and there is a risk of withdrawals from non-resident deposits [43 per cent of foreign funding] and interbank facilities [46 per cent of foreign funding] because a portion of these are sourced from the GCC," said Dyck. 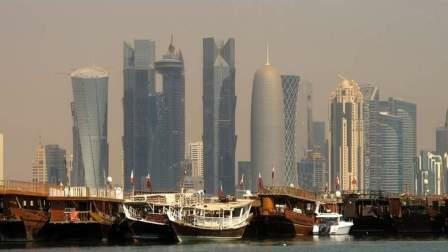 Garbis Iradian, chief economist, Mena, at the Washington-based Institute of International Finance (IIF), said while the Qatari banking sector is well positioned, with a capital adequacy ratio of 16.1 per cent and non-performing loans to total loans of 1.2 per cent at the end of 2016, risks and uncertainty from the sanctions by neighbouring countries could have serious repercussions. "Liquidity pressures could increase if the government opts for more withdrawal of its deposits with domestic banks to finance the deficits. Also, private resident nonresidents deposits could decline from their peak level in April 2017," said Iradian. Qatari stress tests that simulate heightened rollover risk and deposit flight indicate that the banking system would be resilient so long as the repo window remains open. Besides, Qatari authorities have indicated that they are monitoring the situation closely and are ready to provide liquidity should the need arise, analysts said.